Thelonious Sphere Monk (Rocky Mount, North Carolina 10th October 1917 - Hartsdale, New York 17th February 1982) was a jazz pianist and composer. Widely considered as one of the most important musicians in jazz -- he is one of only five jazz musicians to be featured on the cover of Time -- Monk had a unique improvisational style and made numerous contributions to the standard jazz repertoire, including "Epistrophy," "'Round Midnight," "Blue Monk," "Straight No Chaser" and "Well, You Needn't." Widely considered as one of the most important musicians in jazz -- he is one of only five jazz musicians to be featured on the cover of Time -- Monk had a unique improvisational style and made numerous contributions to the standard jazz repertoire, including "Epistrophy," "'Round Midnight," "Blue Monk," "Straight No Chaser" and "Well, You Needn't." He could play be-bop but commented that be-bop "sounds like dixieland to me." His compositions and improvisations are full of dissonant harmonies and angular melodic twists, and are impossible to separate from Monk's unorthodox approach to the piano, which combined a highly percussive attack with abrupt, dramatic use of silences and hesitations; a style nicknamed "Melodious Thunk" by his wife Nellie. Monk was born 10th October 1917 in Rocky Mount, North Carolina, the son of Thelonious and Barbara Monk, two years after his sister Marian. A brother, Thomas, was born a couple of years later. In 1922, the family moved to 243 West 63rd Street, in Manhattan. Monk started playing the piano at the age of six. Although he had some formal training and eavesdropped on his sister's piano lessons, he was essentially self-taught. Monk attended Stuyvesant High School, but did not graduate. He briefly toured with an evangelist in his teens, playing the church organ, and in his late teens he began to find work playing jazz. Monk is believed to be the pianist featured on recordings Jerry Newman made around 1941 at Minton's Playhouse, the legendary Manhattan club where Monk was the house pianist. Monk's style at the time was described as "hard-swinging," with the addition of runs in the style of Art Tatum. Monk's stated influences include Duke Ellington, James P. Johnson, and other early stride pianists. Monk's unique piano style was largely perfected during his stint as the house pianist at Minton's in the early-to-mid 1940s, when he participated in the famous after-hours "cutting competitions" that featured most of the leading jazz soloists of the day. The Minton's scene was crucial in the formulation of the bebop genre and it brought Monk into close contact and collaboration with other leading exponents of bebop, including Dizzy Gillespie, Charlie Christian, Kenny Clarke, Charlie Parker and later, Miles Davis. In 1944 Monk made his first studio recordings with the Coleman Hawkins Quartet. Hawkins was among the first prominent jazz musicians to promote Monk, and Monk later returned the favor by inviting Hawkins to join him on the 1957 session with John Coltrane. Monk made his first recordings as leader for Blue Note in 1947 (later anthologised on Genius of Modern Music, Vol. 1) which showcased his talents as a composer of original melodies for improvisation. Monk married Nellie Smith the same year, and in 1949 the couple had a son, T.S. Monk, who later became a jazz drummer. A daughter, Barbara (affectionately known as Boo-Boo), was born in 1953. After his cycle of intermittent recording sessions for Blue Note during 1947?1952, he was under contract to Prestige Records for the following two years. With Prestige he cut several under-recognized, but highly significant albums, including collaborations with saxophonist Sonny Rollins and drummer Art Blakey. In 1954, Monk participated in the famed Christmas Eve sessions which produced the albums Bags' Groove and Miles Davis and the Modern Jazz Giants by Miles Davis. Davis found Monk's idiosyncratic accompaniment style difficult to improvise over and asked him to lay out (not accompany), which almost brought them to blows. However, in Miles Davis' autobiography Miles, Davis claims that the anger and tension between Monk and himself never took place and that the claims of blows being exchanged were "rumors" and a "misunderstanding." In 1954, Monk paid his first visit to Europe, performing and recording in Paris. It was here that he first met Baroness Pannonica "Nica" de Koenigswarter, a member of the Rothschild banking family of England and a patroness of several New York City jazz musicians. She would be a close friend for the rest of Monk's life. At the time of his signing to Riverside, Monk was highly regarded by his peers and by some critics, but his records did not sell in significant numbers, and his music was still regarded as too "difficult" for mass-market acceptance. Indeed, with Monk's consent, Riverside had managed to buy out his previous Prestige contract for a mere $108.24. His breakthrough came thanks to a compromise between Monk and the label, which convinced him to record two albums of his interpretations of jazz standards. His debut for Riverside, which featured bass innovator Oscar Pettiford, was built around Monk's distinctive interpretations of selection of well-known pieces by Duke Ellington, including "Caravan" and "It Don't Mean A Thing (If It Ain't Got That Swing)". The resulting LP, Thelonious Monk Plays Duke Ellington, was designed to bring Monk to a wider audience, and pave the way for a broader acceptance of his unique style. According to recording producer Orrin Keepnews, Monk appeared unfamiliar with the Ellington tunes and spent a long time reading the sheet music and picking the melodies out on the piano keys. Given Monk's long history of playing, it seems unlikely that he didn't know Ellington's music, and it has been surmised that Monk's seeming ignorance of the material was a manifestation of his typically perverse humor, combined with an unstated reluctance to prove his own musical competency by playing other composers' works (even at this late date, there were still critics who carped that Monk "couldn't play"). Finally, on the 1956 LP Brilliant Corners, Monk was able to record his own music. The complex title track, which featured tenor saxophonist Sonny Rollins, was so difficult to play that the final version had to be edited together from three separate takes. The album, however, was largely regarded as the first success for Monk; according to Orrin Keepnews, "It was the first that made a real splash." 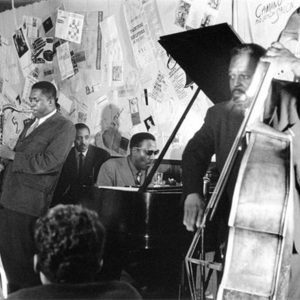 After having his cabaret card restored, Monk relaunched his New York career with a landmark six-month residency at the Five Spot Cafe in New York beginning in June 1957, leading a quartet that included John Coltrane on tenor saxophone, Wilbur Ware on bass, and Shadow Wilson on drums. Unfortunately little of this group's music was documented, apparently because of contractual problems, Coltrane signed to Prestige at the time. One studio session was made by Riverside but only later released on Jazzland; an amateur tape from the Five Spot (not the original residency, it seems, but a later 1958 reunion) was uncovered in the 1990s and issued on Blue Note. On November 29 that year the quartet performed at Carnegie Hall and the concert was recorded in high fidelity by the Voice of America broadcasting service. The long-lost tape of that concert was rediscovered in the collection of the Library of Congress in January 2005. In 1958 Johnny Griffin took Coltrane's place as tenor player in Monk's band. In 1958, Monk and de Koenigswarter were detained by police in Wilmington, Delaware. When Monk refused to answer the policemen's questions or cooperate with them, they beat him with a blackjack. Though the police were authorized to search the vehicle and found narcotics in suitcases held in the trunk of the Baroness's car, Judge Christie of the Delaware Superior Court ruled that the unlawful detention of the pair, and the beating of Monk, rendered the consent to the search void as given under duress. State v. De Koenigswarter, 177 A.2d 344 (Del. Super. 1962). Monk was represented by Theophilus Nix, the second African-American member of the Delaware Bar Association. In 1962, Monk signed to Columbia Records, one of the big four American record labels of the day along with RCA Victor, Capitol, and Decca. He had not recorded a studio album since 5 By Monk By 5 in June of 1959, a year that had seen the dual innovations of free jazz by Ornette Coleman, and modal jazz by Miles Davis via his landmark LP on Columbia, Kind of Blue, enter the jazz world. Monk jumped ship to Columbia as he ran out his contract to Riverside via a series of live albums, working with producer Teo Macero on his debut for the label. Featuring a stable line-up that had been with him for two years, tenor saxophonist Charlie Rouse, bassist John Ore, and drummer Frankie Dunlop, sessions in the first week of November yielded the Columbia debut released in 1963, Monk's Dream. The resources at Columbia allowed Monk to be promoted more widely than earlier in his career. Monk's Dream would remain the best-selling LP of his lifetime, and on February 28, 1964, Monk appeared on the cover of Time magazine, and was featured in the article, "The Loneliest Monk". He continued to record a number of well-reviewed studio albums, particularly the debut, Criss Cross also from 1963, and Underground from 1968. But by the Columbia period his compositional output was much reduced, and only his final Columbia studio record Underground featured a substantial number of new tunes, including his only waltz time piece, "Ugly Beauty." As had been the case with Riverside, his period with Columbia Records contains many live albums, including Miles and Monk at Newport from 1963, Live at the It Club and Live at the Jazz Workshop, both from 1964 with the latter relased in 1982. After the departure of Ore and Dunlop, the rhythm section of Monk's quartet during the bulk of his Columbia period was rounded out by Larry Gales on bass and Ben Riley on drums, both of whom joined in 1964 and would, along with Rouse, be his longest-serving band for over four years. Monk had disappeared from the scene by the mid-1970s, and made only a small number of appearances during the final decade of his life. His last studio recordings were completed in November 1971, near the end of a worldwide tour with "The Giants of Jazz", which also included Dizzy Gillespie, Sonny Stitt, Art Blakey, Kai Winding and Al McKibbon.Monk's manner was idiosyncratic. Visually, he was renowned for his distinctively "hip" sartorial style in suits, hats and sunglasses, and he developed an unusual, highly syncopated and percussive manner of playing piano. He was also noted for the fact that at times he would stop playing, stand up from the keyboard and dance while turning in a clockwise fashion, ring-shout style, while the other musicians in the combo played. Bassist Al McKibbon, who had known Monk for over twenty years and played on his final tour in 1971, later said: "On that tour Monk said about two words. I mean literally maybe two words. He didn't say 'Good morning', 'Goodnight', 'What time?' Nothing. Why, I don't know. He sent word back after the tour was over that the reason he couldn't communicate or play was that Art Blakey and I were so ugly." A different side of Monk is revealed in Lewis Porter's biography, John Coltrane: His Life and Music; Coltrane states: "Monk is exactly the opposite of Miles [Davis]: he talks about music all the time, and he wants so much for you to understand that if, by chance, you ask him something, he'll spend hours if necessary to explain it to you." The documentary film Thelonious Monk: Straight, No Chaser (1988) attributes Monk's quirky behaviour to mental illness. In the film, Monk's son, T.S. Monk, says that his father sometimes did not recognize him, and he reports that Monk was hospitalized on several occasions due to an unspecified mental illness that worsened in the late 1960s. No reports or diagnoses were ever publicized, but Monk would often become excited for two or three days, pace for days after that, after which he would withdraw and stop speaking. Physicians recommended electroconvulsive therapy as a treatment option for Monk's illness, but his family would not allow it; antipsychotics and lithium were prescribed instead. Other theories abound: Leslie Gourse, author of the book Straight, No Chaser: The Life and Genius of Thelonious Monk (1997), reports that at least one of Monk's psychiatrists failed to find evidence of manic depression or schizophrenia. Others blamed Monk's behavior on intentional and inadvertent drug use: Monk was unknowingly administered LSD, and may have taken peyote with Timothy Leary. Another physician maintains that Monk was misdiagnosed and given drugs during his hospital stay that may have caused brain damage. As his health declined, Monk's last six years were spent as a guest in the New Jersey home of his long-standing patron, Baroness Nica de Koenigswarter, who had also nursed Charlie Parker during his final illness. Monk didn't play the piano during this time, even though one was present in his room, and he spoke to few visitors. Monk died of a stroke on February 17, 1982 and was buried in Ferncliff Cemetery in Hartsdale, New York. Since his death, his music has been rediscovered by a wider audience and he is now counted alongside the likes of Miles Davis, John Coltrane, Bill Evans, and others as a major figure in the history of jazz. In 1993, he was posthumously awarded the Grammy Lifetime Achievement Award, and in 2006, Monk was posthumously awarded a Pulitzer Prize Special Citation.